Agustin and Yadira own a ‘finca’, a small agricultural farm in the province of Leon. These Christian friends, concerned for the education of adolescents in their rural area, decided to start a secondary school on their property. The school is registered by the Nicaraguan government and Agustin and Yadira serve as principal and vice-principal. He is also a public accountant. Students attend intensive classes all day Saturday. The government pays the teachers, and students contribute 100 cordobas (around five dollars) a year. 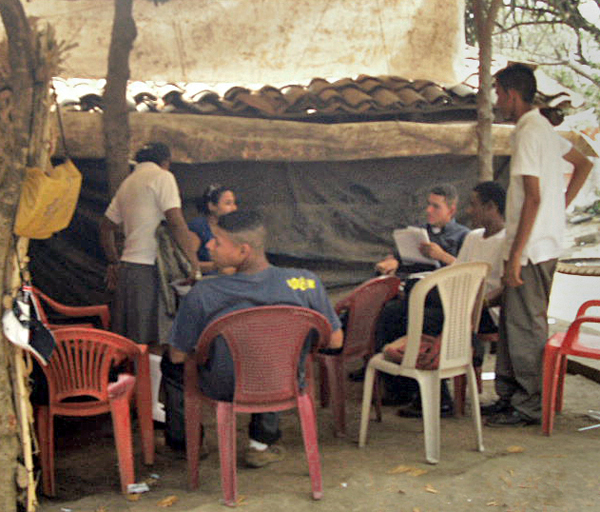 Fifty students attend the school whose classrooms are under trees and shady areas around the house. Agustin and Yadira share the ownership and work of the property with her parents and the large community of relative and friends who live around their home. Agustin and Yadira heard about the Lutheran church’s Christian education program in Nicaragua and Agustin decided to check it out, taking part in Bible studies led by Lutheran Church–Canada’s missionary Pastor Maximo Urroz in the provincial capital of Leon. Having witnessed the Lutheran’s solid and strong Biblical teaching, and recognizing the great need for such education for their students, they invited the missionary to visit their farm to talk about the possibility of teaching the Christian education class of their school. Missionary Maximo accepted the invitation and now leads the Christian education classes on Saturday afternoons. According to the school’s statutes, religious education class is obligatory and students review and take Biblical and religious literature tests. Dr. Neitzel presented the historical background, brief introduction and overview of the Book of Revelation to the students. Different types of millenialists, ‘rapturists’ and heterodox groups have spread false and misleading teachings among the adolescents in that farm community, which has concerned the owners of the school greatly. Some of these teachings have to do especially with the second coming of Christ and the Book of Revelation. Confusion, fear and fanaticism among families and students have risen tremendously lately. In dialogue with missionary Maximo we agreed that the students would have an introduction and overview of the Book of Revelation based on Lutheran confessional teaching and a chapter-by-chapter study to follow. I had the privilege of presenting the historical background, brief introduction and overview on the book to the students. Further dialogue between the owners of the school and the school community resulted in an offer for the Lutheran Church in that area to take charge of the entire school program. They are looking for solid Biblical and confessional teaching. For such there couldn’t be a better foundation than the Lutheran ‘solas’ — Sola gratia, solus Cristus, sola Fe, sola Scriptura. It’s too early for us see where this is leading, but we have a great start. Missionary Maximo, farmers and the church community seem very encouraged by the new development. One of the highlights of my Saturday at the farm was joining the family for a ‘sopa de gallina’ or ‘caldo de pollo’ (chicken soup) cooked in the style only farmers in that area know—very rich, strong, solid and mixed with every ingredient you could imagine for a tasty dish. The dessert was a one-hour seminar with the family and students on Revelation and the End Times. God seems to be ‘revealing’ that He is opening a new door for our LCC mission into this farm community. May the Lord be praised! Rev. Dr. Leonardo Neitzel is responsible for Lutheran Church–Canada’s overseas missions. My mission trip to Nicaragua this time included a visit to Honduras with the president of the Iglesia Luterana Sinodo de Nicaragua (ILSN) Pastor Luis Turcios. In Tegucigalpa we met with Pastor Edmundo Auger, a Lutheran Church–Missouri Synod pastor serving in the Cayman Islands and with Tulio Cesar Mejia, who lives in Tegucigalpa, the capital city. We wanted to explore and discuss the possibility of mission work with LCC’s missionary, Pastor Douglas Aguillar, who is established and serving in the northern part of the country, Olanchito. Tulio Cesar Mejia; LCMS missionary Pastor Edmundo Auger; LCC missionary Pastor Douglas Aguillar; and Rev. 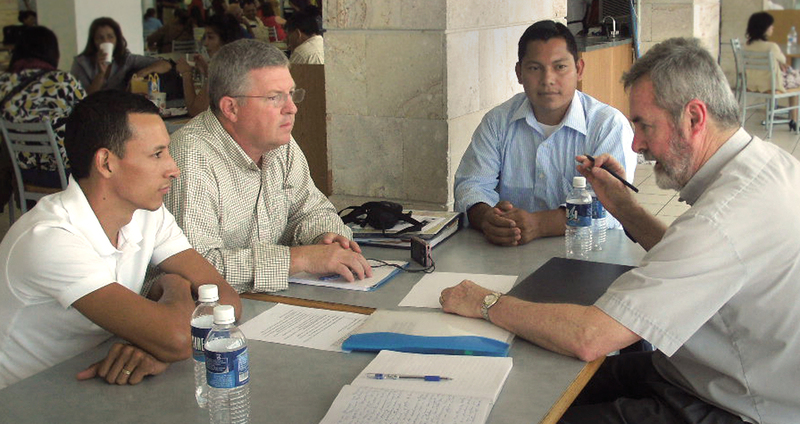 Dr. Leonardo Neitzel discuss plans for expanding the mission work in Honduras. Tulio, a young church leader, took Lutheran Church–Canada-sponsored seminary classes in the Iglesia Luterana Sínodo de Nicaragua (ILSN), worked as lay evangelist volunteer in Panama, and is currently conducting Bible classes with children in Tegucigalpa. Pastor Auger has mentored Tulio and is very encouraged with the work he’s doing. At our meeting we agreed that Tulio should continue his seminary training at the ILSN as part of the new class starting in October 2011. He will work with Pastor Douglas and both men will report to the ILSN and LCC on their missionary programs. Rev. Auger will visit Tulio during the year, study foundational theological doctrine and related areas with him, mentoring and supporting his work with Pastor Douglas. Rev. Auger, in his kindness, offered to assist in special gatherings and mission outreach events in both places, encouraging our church workers in their family life as well as in the work of the mission. President Luis and I travelled to Olanchito where Pastor Douglas gathers children and adults under trees to proclaim the Gospel. We had the opportunity to take part in one of these events which gathered about eighty people. There is a small and faithful group of people who own a piece of land donated by the Lutheran Church in Victoria, B.C. They would like to have their church built as soon as possible. Dr. Paul Loofs and his wife, Elia Enid de Loofs, originally members of the church in Victoria, live in Olanchito and have been of great blessing and very supportive of the work in that area. The congregation’s challenge is now building a church, but they don’t have finances. They own the property, have a blueprint for a good-sized church building, a cost estimate, and are working on the building permit. They would welcome any financial support or labour work in their endeavour. As in Nicaragua, it would be possible for LCC to arrange the building project in Olanchito to be carried out in stages until completion. A volunteer team of builders could lay the foundations in the first stage, then the walls, roof, doors and windows until it’s finished. We pray and trust the Lord will provide these brothers and sisters with help from North American teams to help them build a place for them to continue worshipping the Lord and proclaiming His Gospel to the people in Olanchito. Rev. 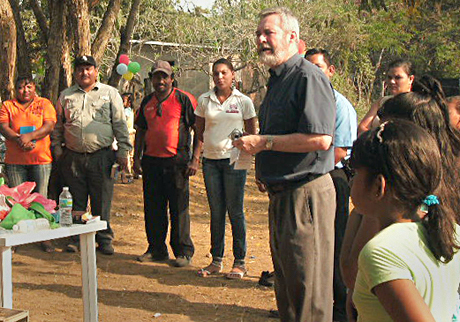 Leonardo Neitzel is Lutheran Church–Canada’s executive responsible for overseas missions. You are currently browsing the LCC On the Road blog archives for April, 2011.